Do you need a bigger file? The file available on this site is 664 x 1024 px. To obtain an alternate file type or higher resolution copy, please contact the owning institution. Scope/Content: Copy of 2nd edition of Richard Blackmore's Prince Arthur, with annotations by John Dennis (formerly attributed to John Dryden). Internal and paleographical evidence establishes that the person responsible for these "numerous Manuscript Critical Notes" is not John Dryden, but the literary critic and dramatist John Dennis (1658[MARC+13]1734). 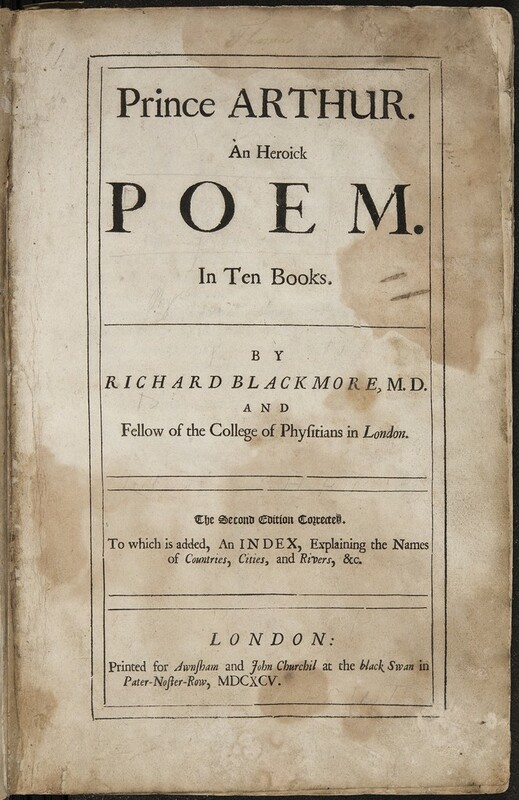 Dennis's extensive underscoring, marks, and annotations focus on (primarily negative) criticism of Blackmore's epic poem, criticism that would later serve as the basis for Dennis's printed attack on Blackmore, Remarks on a Book, Entitul'd Prince Arthur (1696). Dennis's annotations also identify literary allusions and occasionally praise the poem. Heavy water staining at the front of the volume obscure many of the marginal annotations. Scope/Content: Nineteenth-century pencil note on front pastedown endpaper: "The copy of John Dryden the Poet, with his numerous Manuscript Critical Notes" ; Title page has name "Thomas" written in upper margin, as well as faint and illegible interlinear pencil annotations; Verso of rear free endpaper bears the ink inscription "Thomas Gleas[??] his book steals not," an illegible pencil inscription (only "1833" is legible), and an ink list of books (presumably in John Dennis's hand).